Creswick is a former gold mining township 20 km north of Ballarat. It is set in undulating ranges, partly forested, which formed an extensive goldfields area that was discovered during the early 1850s. Creswick has several local industries. It was named after the Creswick Creek pastoral run (1842), taken up by the brothers Henry, Charles and John Creswick. In 1852 gold was discovered on Creswick Creek. Most leads ran north of the future township site, but one ran southwards, just east of the town centre. A goldfields Commissioner, Walter Brackenbury, was appointed in December 1852, and his Commissioner's Camp (Bridge Street) became the site of the Botanic Gardens. In August 1854, a township survey was carried out, the year after the first school was opened. Shortly after the township was laid out, religious and civic institutions were opened: Anglican and Catholic churches (1857), a Wesleyan church (1861) and a court house (1859). 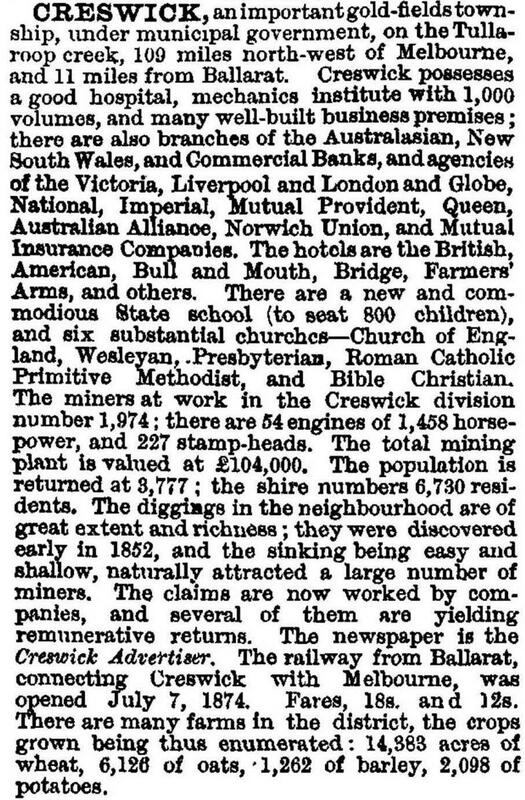 Upwards of 25,000 miners were estimated to be in the Creswick area at peak mining times. The census for 1861, however, recorded a population of 4714, which was to be the highest census figure ever. The easy alluvial gold was quickly won, and deep lead mining became the main form of mining after the early 1870s, particularly to the north of Creswick. Notable mines were the Madame Berry and the New Australasian. Creswick also had a grammar school (1869-1903) which was attended by six children of the Lindsay family. In 1864 Dr Robert Lindsay set up his practice in Creswick and in 1866 moved to a house at the corner of Raglan and Cambridge Streets, a few doors from the Grammar School. His son Norman, author and painter, depicted aspects of Creswick in three of his novels, Saturdee (1933), Redheap (1930) and Halfway to anywhere (1947). Another son, Percy, painted numerous scenes of Creswick, of which over 20 are in the Ballarat Fine Art Gallery Collection. One Percy Lindsay painting depicts Chinatown, Creswick, a reminder of the Chinese gold miners. One daughter, Ruby Lindsay, was also a painter and illustrator. Creswick was the birthplace of other notable Australians: John Curtin (1885), Labor Prime Minister of Australia, 1941-45; Sir Alexander Peacock (1861), Victorian Premier, 1901-02, 1914-17 and 1924; and Thomas Laby (1880) physicist. Curtin is remembered by memorial gardens and the war memorial and Peacock by a cairn in Cambridge Street. W.G. Spence (1846) lived in Creswick during the time of the Eureka rebellion, was a Sunday school superintendent of the Creswick Presbyterian church, secretary of the Creswick Miners' Union and went on to found the Australian Workers' Union and became a Federal Parliamentarian. In 1882 the New Australasian gold mine was the scene of a disaster when 22 miners were drowned in a flooded shaft. It was a record loss of lives for an Australian mine. North and east of Creswick there are hills with good volcanic soil which was first used for growing wheat and oats. As grain growing moved northwards in Victoria, sheep and cattle grazing took over. Potato growing continued in fertile pockets. South of the township the hillier country was used for timber harvesting. Although the forests had been despoiled for mine timber and firewood, plantings by Government foresters began in the 1880s. In 1909 a forestry school was opened a few hundred metres east of Creswick, incorporating Creswick's first hospital building in its grounds. Between 1910 and 1980 the school trained 500 foresters, and its site is surrounded by landscaped gardens with extensive pine plantations beyond. The forestry school influenced the laying out and planting of parks and street trees which give Creswick a high level of landscape quality. The Brackenbury tourist road passes through the grounds of the forestry school. Creswick's main public space is Calambeen Park in Cushing Street. It was the site of the Chinese camp (much in decline when painted by Percy Lindsay in 1894), and was mined by sluicing around the turn of the century. A swimming pool (1910) was constructed in a hole made by the sluicing. The caravan and camping area is in Calambeen Park. 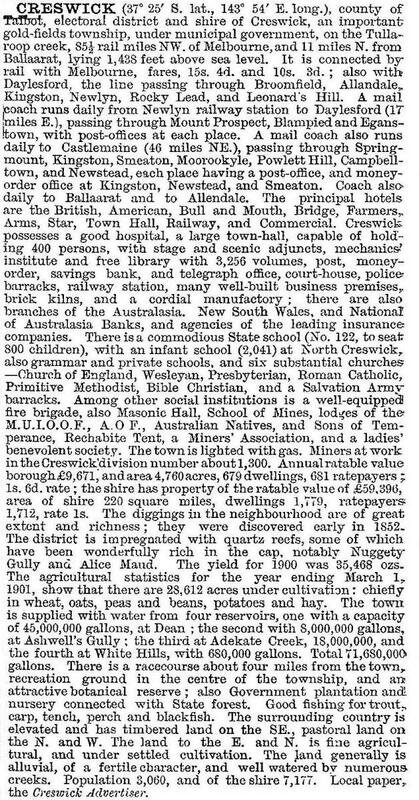 The borough of Creswick was united with Creswick Shire on 29 May 1934. Creswick Shire became part of Hepburn Shire in 1994 and there is branch shire office next to Creswick town hall. Creswick has an extensive stock of historic buildings, particularly cottages and houses, ranging from miners' dwellings to two-storey buildings constructed by better-off professional residents. Registered historic buildings include a bluestone gold office (1859), the School of Mines and Technology (1861) and later Bank of New South Wales, the town hall (1876), the hospital (1863) and the railway station complex (1874). The Creswick museum is in the town hall. Creswick has a golf course, tennis courts, an oval, bowling greens, several small industries, including the Creswick Woollen Mill, a good local shopping centre, State and Catholic (1858) primary schools and a hospital. There is also a State primary school (1878) at Creswick North, 2 km north of the centre of Creswick. The railway station is no longer on a junction, the branch line to Daylesford having closed in 1976. In September 2010 and again in January 2011 many parts of regional Victoria experienced widespread severe flooding. In Creswick, rain filled the two dams that sit above Creswick in the catchment, filling the Creswick Creek until it burst flooding homes and businesses that had only just been repaired from the September 2010 floods.